Wanting Elvis to Leave the Building – Or Why is a Conch Shell in My Ear? For a week or more, I have had a conch shell in my right ear. The doctor called it an ear infection and said the ear is blocked with fluid, but I know the sound of the sea in a conch shell when I hear it. Sorry doc. So this thing has to go. And soon. 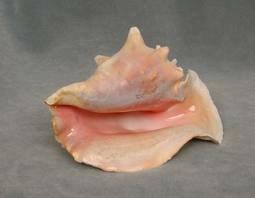 There are a number of theories about how to remove the conch shell. The doc favors antibiotics. Only problem: who decided all antibiotic pills have to be the actual diameter of my throat? Choking to death is not an option for getting well. So just like any pediatric victim of an ear infection, I have a brown bottle of cherry flavored liquid and a squirting teaspoon dispenser. So far the results from option one are not stellar. Anyway, according to the chart, I developed this annoying symptom, not to romance the sea in my ear, but because I am “Angry. Not wanting to hear. Too much turmoil and my parents are arguing.” Well, if I am angry, I have no idea why. I do want to hear. Any yes, my parents were champion arguers but one of them has been dead for more than thirty years, and I haven’t lived with the other one for even longer. Granted she is probably is still arguing alone, but I can’t hear her with either ear. But a good affirmation or two can’t hurt. So I am chanting, “Harmony surrounds me. I listen with love to the pleasant and the good. I am a center for love.” I like the last one, a lot. And after chanting these at least once, the conch vanished for about three minutes. Really. Like Elvis, it left the building. But not for long. So now I am an antibiotic swigging, chanting host to a conch shell in my ear. Perks: cherry taste of the med, and feeling good when I say “I am a center for love.” Downside: well, we know that one. Option three. The Abraham-Hicks approach: that which you dwell on gets bigger. So DON’T THINK ABOUT IT. Kind of difficult when you are trying to HEAR, but I’m game. Option four and final option for now: Go fill up the bathroom with steam from the shower and breath it to open my sinuses and hopefully, my ear. Hey, it’s pleasant, harmless, and tasteless, and I can chant while I don’t think about the ocean roaring in my ear! And I can light the lavender candle to banish the anger I didn’t know I had. (Still skeptical about that one.) Will let you know when Elvis leaves the building for good.